Manufacturing was the only industry to record a decrease. Nonfarm private employment increased by a seasonally adjusted 175,000 jobs for January, according to Automatic Data Processing's (NASDAQ:ADP) National Employment Report (link opens in PDF) released today. The human capital management company partners with Moody's Analytics to produce this monthly report based on ADP payroll data representing 416,000 U.S. clients that employ nearly 24 million workers in the nation. This is private businesses only. After rising a revised 227,000 jobs for December, analysts had expected January's numbers to slow down to an adjusted 170,000 jobs. Private payrolls have been on the rise since early 2010, but month-to-month changes continue to be somewhat volatile. The 175,000 jobs is consistent with average monthly growth in 2013, according to ADP President and CEO Carlos Rodriguez. 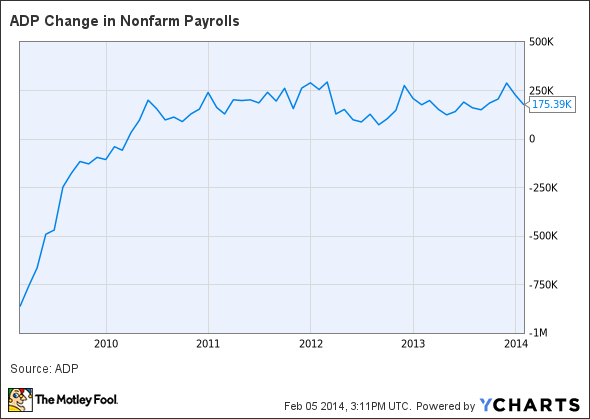 ADP Change in Nonfarm Payrolls data by YCharts. Small businesses (1-49 workers) contributed the most to January's employment jump, adding 75,000 employees to their ranks. Medium (50-499) companies tacked on 66,000 jobs, while large (500+) companies contributed just 34,000. While this month's report squeaked ahead of analyst estimates, gains were uneven across sectors and industries. The services sector soared with 160,000 additions, whiles goods-producing companies barely budged with 16,000 more employed. Manufacturing was the only industry to record a decrease, down 12,000. Construction added 25,000 jobs, while trade/transportation/utilities added 30,000. Cold and stormy winter weather continued to weigh on the job numbers. Underlying job growth, abstracting from the weather, remains sturdy. Gains are broad based across industries and company sizes, the biggest exception being manufacturing, which shed jobs, but that is not expected to continue.